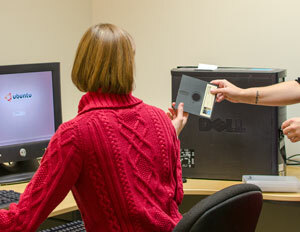 The Digital Archaeology Lab plays a significant role in the School of Information’s research in digital archiving. The facility itself provides multiple computer platforms, including a complete forensic workstation, a variety of media drives, and current and legacy software for the purpose of recovering digital objects from noncurrent environments for transfer into a preservation environment. Students and faculty carry out research to develop extraction protocols and to test efficient and safe means of treating legacy media and formats, through projects working with significant digital collections using the School’s DSpace institutional repository. School of Information students and faculty are primary users of the lab, but the School partners with other UT and Austin archival institutions to address digital archiving problems on a regular basis. Interests: digital archiving, preservation of formerly existing digital environments, digital repository as platform for preservation. (2002) with Marlan Green, Sue Soy, and Stan Gunn. Coming to TERM: Designing the Texas Email Repository Model. D-Lib Magazine, September 2002. (2004) with Maria Esteva, Anne Marie Donovan, Addy Sonder, and Sue Trombley. Archival Appraisal, Websites and DSpace. Proceedings of the Imaging Science and Technology Archiving 2004 Conference, 66-70. (2008) Case Study: The Eyes of Texas: What can archivists learn from working with a digital institutional repository? In Richard Pearce-Moses and Susan E. Davis (eds. ), New Skills for a Digital Era, 65-72. Society of American Archivists. (2014) Technical Infrrastructure and Digital Heritage Preservation. Archival Research and Education: Selected Papers from the 2014 AERI Conference, Litwin Press, 159-181. (2017) Archiving Digital Objects as Maintenance: Reading a Rosetta Machine. Preservation, Digital Technology & Culture 46(1), 7-16. (2012) The ethical and legal issues of historical mental health records as cultural heritage. Proceedings of The Memory of the World in the Digital Age: Digitization and Preservation, Vancouver, BC, Canada, 735-744. (2015) Taking the long view of medical records preservation and archives. Journal of Documentation. (2007). Preservation of a Natural Electronic Archive. Proceedings of the Imaging Science and Technology Archiving 2007 Conference, 67-70. (2008) with Lorraine Dong and Megan Durden. Batch Archival Processing: Preserving Arnold Wesker’s Digital Manuscripts. Archival Issues 30, (2), 91-106. (2009) Kim, Sarah. Using an Institutional Digital Repository for Digital Collections of Retired Faculty Members. Poster, Joint Conference on Digital Libraries (JCDL), Austin, TX. (2013) Personal Digital Archives: Preservation of Documents, Preservation of Self. Dissertation, School of Information. (2013) Landscape of Personal Digital Archiving Activities and Research. In Donald T. Hawkins (Ed.) Personal Archiving: Preserving Our Digital Heritage, Information Today, Inc.
(2007) Authorial Voice: An Argument for Increased Author Participation in the Processing of Literary Papers. MSIS thesis, School of Information. (2010) with Matthew Kirschenbaum and Richard Ovenden. Digital Forensics and Born-Digital Content in Cultural Heritage Collections. Council on Library and Information Resources, Publication 149. (2006) When Not all Papers are Paper: A Case Study in Digital Archivy. Provenance XXIV, 23-35. (2008) with Thomas Kiehne. Guarding the Guards: Archiving the Electronic Records of Hypertext Author Michael Joyce. In Richard Pearce-Moses and Susan E. Davis (eds. ), New Skills for a Digital Era, 57-64. Society of American Archivists. (2012) Collaboration Yields Digital Data Recovery, Southwestern Archivist 35(1), 24.